In addition to traditional framing demands, Around the Corner offers extensive options for restoring older pieces. Weathered photographs and painting can be reconstructed into high quality images or beautiful giclees. Eager to go beyond the impersonal restrictions of chain stores, the highly-trained staff of Around the Corner is more than eager to personally install a piece in your home or office. To celebrate Around the Corner’s new beginning as a thriving artistic location within the community, stop by the grand opening celebration at 637 Tremont Street to meet local artists, business owners, and friends between 6 and 10PM on Thursday, October 8th. For more information, visit http://www.framearoundthecorner.com/. 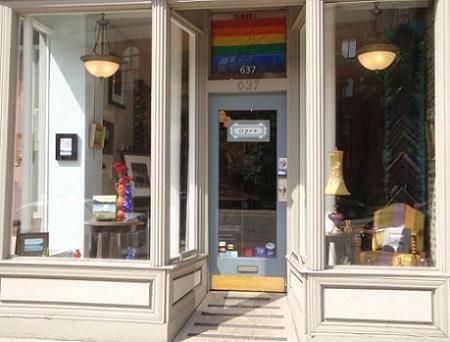 I love the gay flag in the window and it’s great to know that former students are finding the support they need to stick around the city long enough to become part of the ‘creative class’.